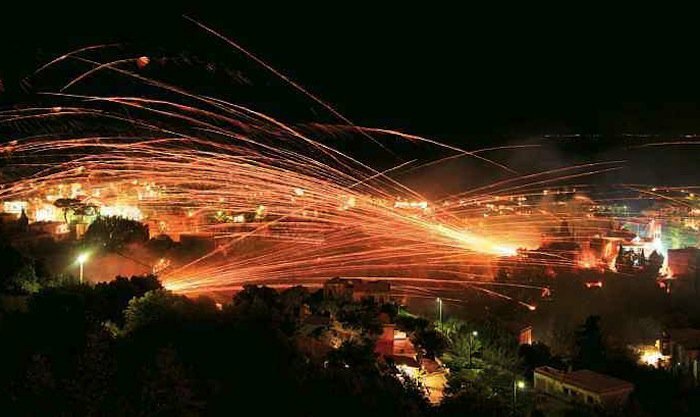 The rocket war of Chios has been taking place on the Greek island for more than 200 hundred years. One of the most beautiful Easter spectacles in Greece is also a dangerous one, and many locals are opposed to the “war” between the two churches in the village of Vrodados. This year the local authorities have also threatened to arrest those who will try to revive the custom. The organizers on the other hand say they ‘ll continue as the custom is embedded in Chios’ culture. Chios Deputy Mayor, Stratis Gdyssis, made a statement on Chios radio saying that up to date, the vast majority of houses in the area have been covered with wire mesh in order to avoid damages that may be caused by the dropping of rockets. According to the Mayor, the plan is for a smaller number of rockets to be dropped — a total of 10,000 from both sides combined — and the throw-time will decrease from 11 p.m. on Holy Saturday until 12 a.m. Easter Sunday. Those who are not from the area will be banned from throwing rockets. “There is an opportunity for the custom to return to its roots and we need to help everyone,” the Mayor said, focusing on the wounds that have been created in the local community of Vrodados due to this rivalry. Mr. Gdyssis concluded with certainty, that the rocket custom will carry on this year, stressing that an effort must be made to keep it safe.